The resolution approved by the U.N.’s most powerful body commended to lift sanctions against Eritrea following its thaw in relations with Ethiopia’s PM Abiy blind support. Ethiopia’s so-called “reformist” prime minister, Abiy Ahmed, who came to power in April and accepted an international commission’s border decision that favored Eritrea. 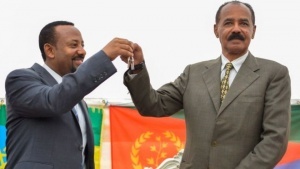 The removal of the sanctions was the culmination of regional political developments that unfolded since Ethiopian Prime Minister Abiy Ahmed and Eritrean President Isaias Afewerki signed a peace agreement and announced normalization of ties in Asmara on July 9, ending a 20-year conflict. Ethiopia is the regional power and actions by the country’s leader set off several diplomatic thaws, including one between Eritrea and Somalia. Leaders of Djibouti and Eritrea, which also had a turbulent relationship after multiple border clashes, met with the help of Ethiopia, though there has been no breakthrough. An arms embargo, asset freeze, and travel ban were imposed in 2009 amid claims Eritrea supported al-Shabab militants in Somalia. Eritrea always denied the accusations.